Each spring, the Mayfaire Renaissance Festival provides a unique opportunity to step back in time and play the fool. The Royal Court of Queen Ariana and King Leopold is, for a short time only, located at the Calhoun County fairgrounds in nearby Marshall Michigan. Guests of our Lansing Bed and Breakfast need only drive 30 – 40 minutes to experience the very best of the Renaissance (Michigan style). Go back in time at the 2011 Mayfaire Renaissance Festival. Patrice Blackbottle is a beguiling story teller who offers free iridology scribing sessions. Robyn the Bard is a musician blessed with the ability to transform modern songs into Renaissance ballads or Irish drinking tunes. He will woo the object of your affection (if paid in coin). Professional Pixies Yarrow and Dywn Eldritch sing, dance and fight while on a Very Important Quest. Ric Roc Zoo is a juggler extradordinaire, mime, stilt dancer, and all around magical physical comedian. Her Majesty’s Royal Guard consists of impressive knights and their squires. Watch their “fully armored, full contact / combat fighting show”. Not for the faint of heart or squeamish. You’ll be ready for a pint at our English Pub after spending the day at Mayfaire! Shops at the Mayfaire Renaissance Festival ply much interesting merchandise: herbs and horns, crystals, dragon tails, hand painted shields, embroidered banners, and hand-made maces. Less eccentric items, such as clothing, jewelry, and books, are also available for purchase. 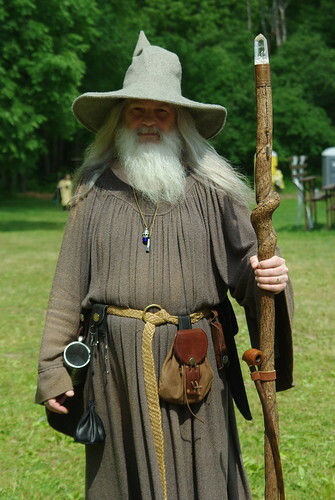 The Mayfaire Renaissance Festival takes place this weekend, May 21-22, and May 28-31, 2011. If you’re already planning to be at our Bed and Breakfast Eaton Rapids MI during one of those times, consider dropping by the festival. If not, consider planning a trip. How often does one get the opportunity to visit a Royal Court of the Renaissance?